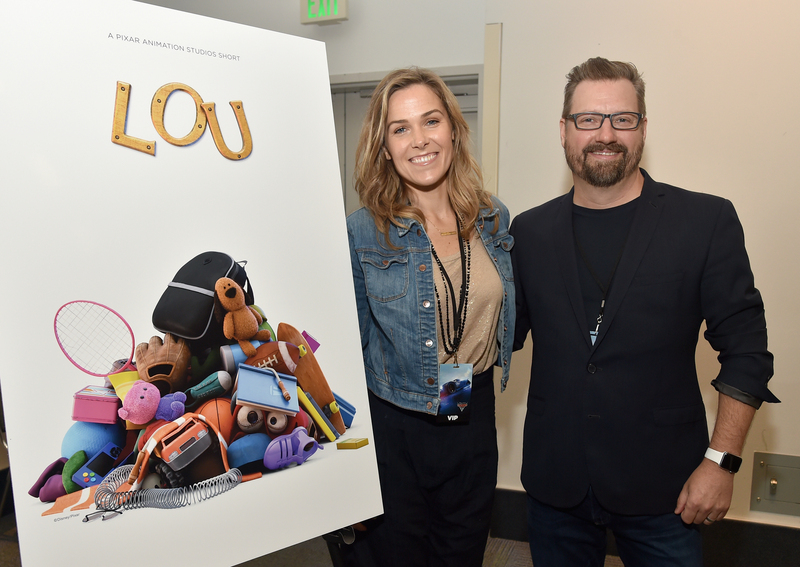 At the Cars 3 press junket on Saturday, we got to learn loads of new information about Lou, the short that will be playing in front of the film this Friday. During the making of presentation, director Dave Mullins and producer Dana Murray gave us some wonderful behind the scenes information about how the short was slowly pieced together. Lou is Mullins’ directorial debut and he’s spent 4 years working on it. He’s even been pitching short film ideas since 2005, but Lou was the first one given the green light from the studio. Mullins is passionate about telling good stories and he started searching for ideas that would stick. He wanted something full of heart. And he turned to the inspiration that came from his childhood, such as moving around a lot due to his father’s job, and leaving behind friends in every city – at time, he said, he almost felt invisible. “When you bring an inanimate object to life, you have to think about it’s intended purpose in the world.” The lost and found box was initially a bully, stealing the children’s toys in the playground and then eventually learning his mistakes and returning them at the end of the film – but that didn’t work because there was nothing to love about him. At one point during the conception of Lou, the character itself was actually a little boy with all of these toys attached to him. Instead, Mullins went back to the core of what the character was: a lost and found box. It was meant to find and return lost toys to children, so that itself sparked an idea that Lou himself would be the hero/protector of the playground. Mullins’ wife, Lisa, who’s a stop motion animator, helped him pitch the film to John Lasseter and Pete Docter by creating a real life maquette of Lou. The model showed how the character would be incorporating objects in to his design and how he would be bringing this character to life by forming him with toys. The overall design of Lou changed throughout the course of the film as they tried to figure out the easiest ways to animate him, but in the end they went back to simple design that Lisa created for the pitch (which in turn, you will see in the finished short). Dana Murray jumped from Inside Out to help Mullins as producer on Lou. Her biggest job, besides scheduling and budgeting, was partnering with Dave and forming a deep friendship with him so that she ensured he wanted to tell the story he set out to create. During story development they had the obvious challenges like how they’re going to dramatize Lou when he’s built with all of these random toys, and second, how are they going to populate a playground when this is just a short film. If you look closely at the children in the short and even the bully, J.J., you’ll be able to find re-use designs from Finding Dory and Inside Out. “What pitches well, doesn’t necessarily play well on screen. This happens every time you go into a new department and without fail, when your story is taken through the different departments, it’s just another moment to remake your film. And at Pixar, you’re never really done working on story.” Mullins and Murray had to completely change Lou‘s story several times throughout the course of the film as they got notes from Lasseter and Docter, and when they took their production to the next stage of development. The Lou at the start of this production, when it was initially pitched, is something completely different to what’s on screen. With every Pixar film, they always have to try and raise the stakes regarding animation and technology. With Lou‘s case it was actually animating this complex character and making it look as believable as possible. “The simplest solution to animating Lou was that every piece of him needed to be animated by hand… everything was animated like how a stop motion animator would do it. To this day, I still have animators cursing my name. But despite all that, we at Pixar love these challenges and the animators really dug into Lou. They were up for the task.” In regards to Mullins using simulations in Lou, Mullins and his crew used cloth simulation on Lou’s red sweatshirt as well as many other elements depicted throughout the film. “When we animated J.J.’s entrance, it was a great intro but we had some problems with it. The first one was that J.J. wasn’t really that entertaining, he’s just kind of mean for no reason and because of that, it was getting in the way of the ending. We really had to re-think that character again. So the question was, how do you make a bully funny? How do you end of caring for him? And this got me thinking about what motivates bullies. A bully usually acts one way because they want one thing: attention. So, J.J. became a kid who constantly disrupted other kids to get attention, making him an outsider. When Lou forces him to act with compassion, this changes how the other kids see him and he finally gets the thing that he really wants, which is acceptance.” This subtle change had an enormous impact on the film and showed the right character growth that was needed for both J.J. and Lou. It’s safe to say that Lou is now one of our favorite Pixar shorts and we’re so excited for you to experience it on the big screen this Friday, June 16th. Stay-tuned for coverage on the actual Cars 3 press event and reviews of the films.